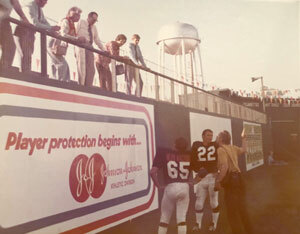 A Martinez resident recalls his gridiron glory days, Hollywood-style. To hear Columbia County resident Donnie Hixon tell it, the best days of his life were those spent at the Georgia State Prison at Reidsville in the fall of 1973. It is also where Hixon received numerous punishing blows to his body over the course of five weeks. However, his time spent inside the walls of the maximum security prison, a massive, white structure situated about 110 miles south of Augusta, was of his own volition. 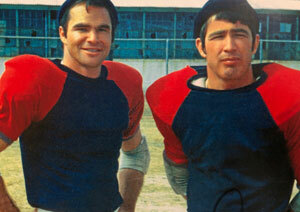 He was part of the cast of The Longest Yard, the box office sensation that starred budding movie icon Burt Reynolds. And not just in any role, mind you. Hixon, a former semi-pro quarterback was selected as Reynolds’ stand-in double for the film, a role that the Augusta native says he was honored to play. 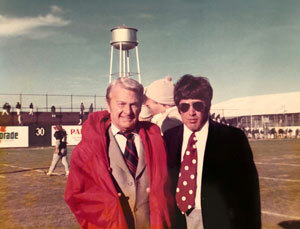 Reynolds, who died in September at age 82, played college football at Florida State, and the chance to return to the gridiron as a quarterback in a major motion picture was a dream come true. Hixon had been a standout football player in the Marines and afterwards as quarterback with the Augusta Eagles semi-pro team. As luck would have it, a select number of Hixon’s teammates also were chosen to take part in the film. After a prison riot in Oklahoma at the movie’s original prospective location, the Reidsville facility was hurriedly selected as a replacement. 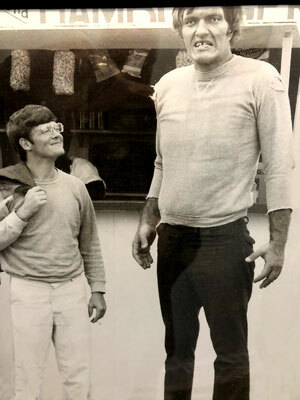 As Reynolds’ stand-in, Hixon took the physically punishing shots from a cast of former NFL greats, including fearsome Green Bay Packers Hall of Fame linebacker Ray Nitschke. 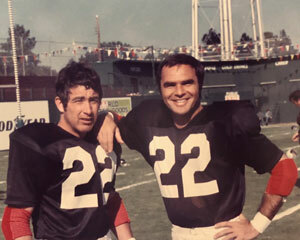 Reynolds and Hixon both donned number 22 jerseys in the film, but after calling the signals at quarterback, the actor went back to the sidelines and watched from an easy chair as the other number 22 took the ensuing blows. Both were in great shape, and looked enough alike that with helmets on and slick film editing, it was nearly impossible to differentiate between the two onscreen. Defensive players didn’t care which number 22 they tackled — they just wanted a shot at whichever pretty boy was toting the football. Hixon admits to not getting much sleep the night before heading off to the prison, and he was nervous on his drive to Reidsville. “Working with Burt Reynolds?… you’ve got be kidding.” It felt like a dream. Protection for the star-studded cast of actors and former professional football stars that converged on Reidsville was job one for the Georgia Department of Corrections. Still, Hixon’s mind was set. After all, it was Nitschke who delivered the most punishing blows. In February Hixon returned to Reidsville for the first time in nearly half a century (this writer accompanied him to document the visit), and fresh memories flooded his mind. He recounted his first day at the prison in 1973. 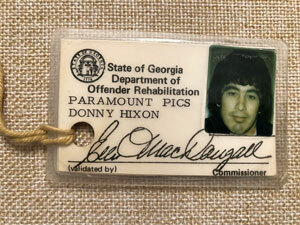 It was Hixon’s Paramount Pictures ID card and a scrapbook full of rare photos from the production that played a large part in getting us inside the prison. One look at Hixon’s old ID and warden Marty Allen knew this was something he hadn’t encountered before. Sure, he had seen the pictures on the fifth floor prison walls that documented the event, but never had anyone shown up looking to get inside the prison to re-live those days. 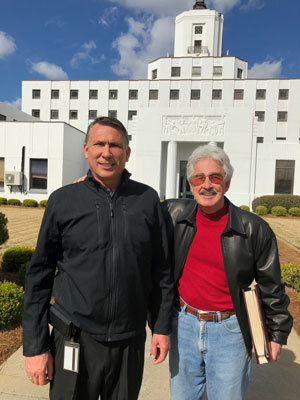 The warden quipped that Hixon’s 45-year-old ID card came without an expiration date, then made a few phone calls and warmly welcomed Reynolds’ stunt-double back to Reidsville for a tour. High atop the prison, one floor up from death-row, rests a small room that houses the now obsolete electric chair, one that was still in use when The Longest Yard was filmed. A barred window not far from the chair overlooks the one-time field put in place for the production. The movie’s original script and countless pictures from those days line the walls in that same room. The actual recipe that went into making a motion picture at Reidsville went something like this: Carefully select a dozen or so choice Hollywood stars, add a dozen seasoned former NFL standouts and make room for Hixon, 14 of his Eagles teammates and three of their coaches. Stir slowly, sprinkle with inmates (who auditioned for and won roles in the film), and top things off with a Hollywood production crew. Place in the oven and bake for five weeks at south Georgia outdoor temperatures. Contain the mixture within a perimeter of razor sharp wire – and be sure not to let it boil over. Remove and serve hot to movie-goers worldwide, popcorn optional. The finished product — an irreverent and not politically correct low-budget production — was a smash hit with moviegoers, grossing $43 million. With similar box office numbers in back-to-back movies, (Deliverance, 1972 and The Longest Yard, 1974), Reynolds cemented his name as a bona fide leading man. Hixon kept in touch with Reynolds through the years and even paid his acting acquaintance a visit in Florida several years ago. While he was saddened to hear of Reynolds’ passing, Hixon was not completely caught off guard. “I’m sorry that he died, but he had been in bad shape for years and years and may be better off,” he says. But Hixon still has his memories of Reynolds and the fall of 1973 at the Reidsville prison— the time of his life. 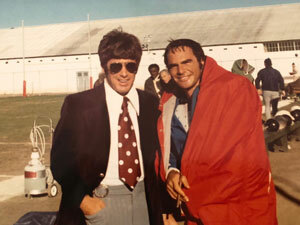 In collaboration with author Stan Byrdy, Hixon’s stories from The Longest Yard are recounted in the upcoming book, Behind the Scenes with Burt Reynolds at Reidsville State Prison. The book, due for release in December, includes never-before-seen photographs of Reynolds, Hixon, Hollywood legends and former NFL standouts in the making of the film. Published on October 27, 2018 in Features and tagged front by Kristy Johnson.